(Newser) – Mystery solved? 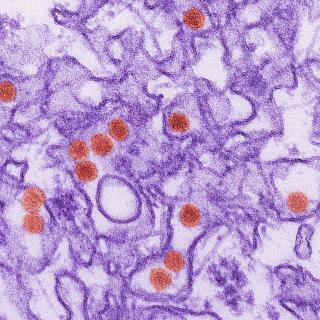 An elderly Utah man who harbored exceedingly high levels of the Zika virus before he died in June, making his the first death in the continental US linked to the disease, may have passed it onto his son through his sweat and tears. That means the illness can potentially be spread in ways other than mosquito bites and rare cases of sexual transmission or a mother passing the virus to her fetus, the AP and Guardian report. A study published Wednesday in the New England Journal of Medicine details that the 73-year-old had traveled to southwest Mexico, from which he emigrated in 2003, for a three-week visit and that he and other family members were bitten by mosquitoes and contracted the virus. Eight days after getting back to the States, he was admitted to a Salt Lake City hospital, where his 38-year-old son visited him. Zika also is routinely passed from mother mosquito to eggs, meaning that it can overwinter easily in most of the US. Why not ban travel between the source countries and here until we get a handle on this? the world obsesses over a miniscule diversionary matter. World stays the same another generation. Sheep to the slaughter. Easy every time. for dessert top it off with hours watching "Escaping Polygamy"